More Italians have been on top of podiums than any other nation. Be it skimo racing, car racing, motorcycle racing, trail running, pasta making, you name it, the Italians have been there and done that. Italians are steeped in success, and the Karpos Race Suit is the official race suit of the Italian National Team. Maybe it’s all in the suit? The entire suit is made of Lycra Power, a material with graduated compression powers that purportedly increase blood flow, oxygen delivery, and lactic acid flushing. The leg panels feature Gore Windstopper fabric, a windproof shield that keeps your pistons warm when the wind picks up. The shoulders have a large silicone anti-slip section to keep your shoulder straps in place, which means you can focus on going fast instead of your pack. Two massive external skin pockets provide quick and easy access to your magic carpets. One main zipper with a top and bottom pull tab provide immediate access to the inside of your suit. Two external zippered pockets are designed for a beacon but will easily house a phone, camera, or some food. 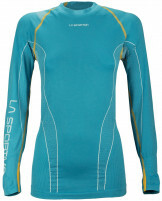 A flexible neoprene panel with Cordura backing protects you from your own speedy ski edges. In light of the masterful construction, plentiful pockets, and light DWR finish to ward-off weather, the Karpos Race Suit is destined for success. Front Vislon zip with top and bottom pull-tab provide lightning-fast access to internal pockets. Two huge external skin pockets for unmatched speed in transitions. Collar and wrist cuffs are finished with soft Thermofleece for warmth and comfort. YKK Zips and Cordura fabric, Karpos’ favorite ingredients. Lycra Power fabric has magic properties that are only believable because Italians keep winning. No size chart in link. Ok for GS and SL racing? Hi SMk! I would not recommend racing GS or SL in this suit. Unlike the FIS race suits that function like body armor, these are destined for ISMF sanctioned racing (ski mountaineering) and function more like spandex, so there is no padding available in these suits and they are very, very breathable.